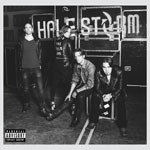 Share the post "Album review: HALESTORM – Into The Wild Life"
First, let me nail my colours to the mast – I loved Halestorm’s eponymous 2009 debut. Under the guidance of producer Howard Benson it was perfect radio friendly female fronted pop/rock from the first to last note. And Lzzy Hale the most exciting vocal prospect for a generation. Their follow -up – The Strange Case Of – (2012) was a decent enough effort, but like many second albums it fell well short of its predecessor as the band went for a more ‘in your face’ style. Whether that was Benson’s absence from the writing credits we can only conjecture. Those links have been completely severed for Into The Wild Life and as a result (?) the Halestorm sound continues to veer towards bombast and bluster, and seemingly aimed at the juvenile audience. At least, that’s the overriding impression on first listen. But dig a little deeper and Into The Wild Life emerges as something of a mixed bag without a clear direction. Lzzy is still the undisputed focal point, without whom the band would undoubtedly not have the same profile. And the best moments are when a little restraint is exercised – ‘Bad Girls World’ and ‘What Sober Couldn’t Say’ are as good as any of their more accessible material, ‘I Am The Fire’ is suitably incendiary, ‘Dear Daughter’ the obligatory piano led ballad (reminiscent of Pink’s ‘Conversations With My 13 Year Old Self’), and ‘I Like It Heavy’ just rocks. This entry was posted in ALBUM REVIEWS, ALBUM REVIEWS (Mobile), All Posts and tagged album, Halestorm, hard rock, Into The Wild Life, Lzzy Hale, review. Bookmark the permalink.